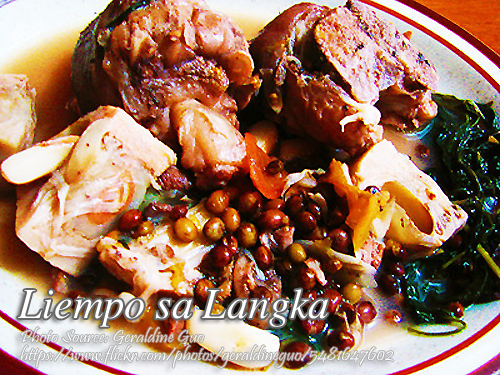 Liempo sa langka is I think a variation of the Ilonggo dish called KBL (Kadyos, Baboy at Langka) since this recipe contains tomato sauce. Kadyos or pigeon peas is not very familiar to most of us. This legume is similar to green bean or baguio beans but with the bulging oversized seeds in the pod and the skin looks rough. You can buy it fresh in the wet market but usually it is sold dried so you have to soak them first in water to make it edible. To cook liempo sa langka; Combine all ingredients in a pot except the kangkong. Bring to a boil then lower heat and simmer until tender. Add the kangkong stalks and simmer for a few minutes more. Then add the kangkong leaves and simmer for a few seconds then turn off heat and serve. Combine all ingredients in a pot except the kangkong. Bring to a boil then lower heat and simmer until tender. Add the kangkong stalks and simmer for a few minutes more. Then add the kangkong leaves and simmer for a few seconds then turn off heat and serve.